Arriving in Seattle last week for the Northwest Flower & Garden Show was like traveling to the tropics from Siberia. A cold snap in the mid-Atlantic had its icy hold on the region and when I landed in Seattle, I shed all my gloves, jackets and scarves with relief and basked in mid-60’s weather. Flowers were in full bloom outside and native Seattleites assured me that the warmth was unusual weather this early in the season. Camellias and Hellebores were in bloom everywhere. 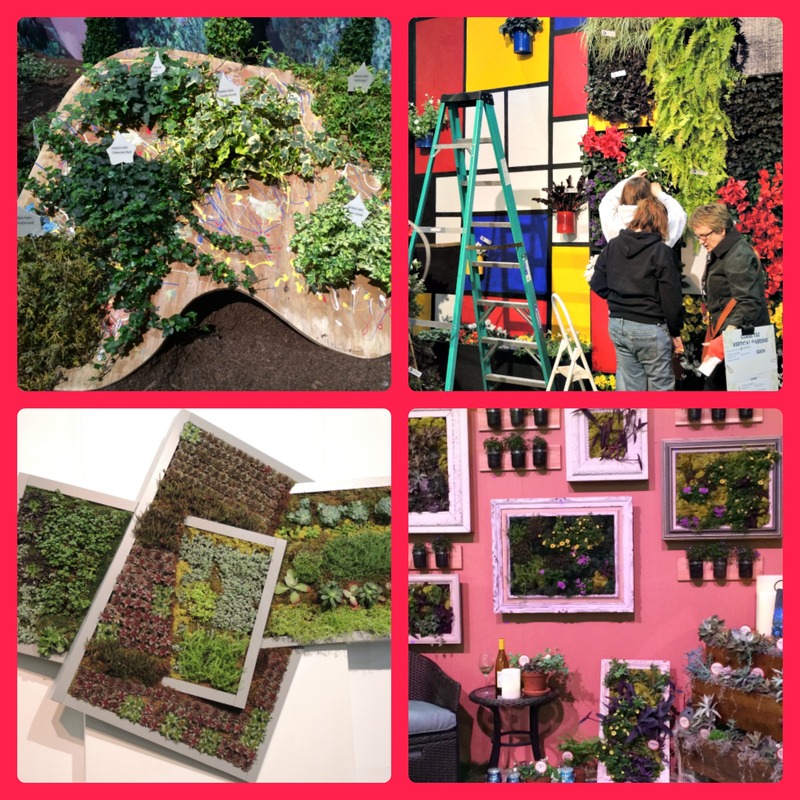 I had never been to the Northwest Flower & Garden show but was doing two presentations there and was very impressed with the size and scale of the show. 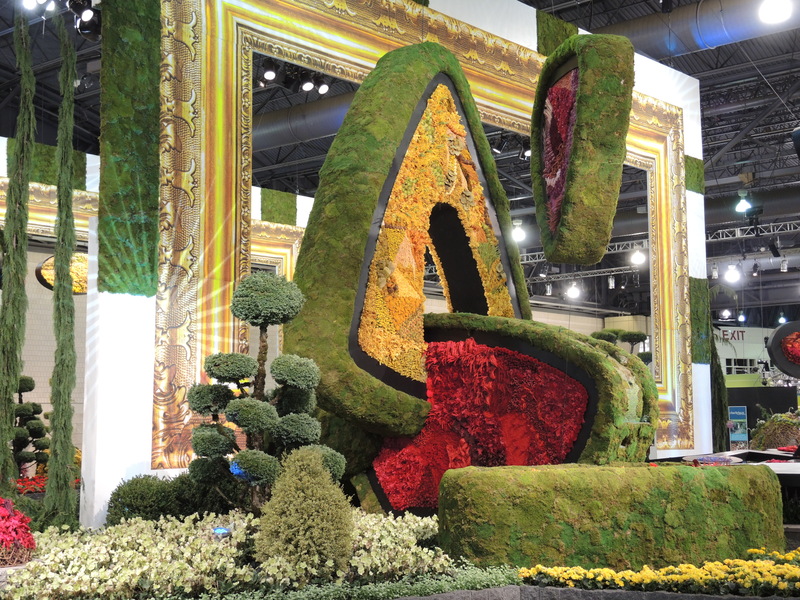 A heart (It was Valentines weekend) of thousands of succulents towered over the front entrance to the show. The Northwest Flower & Garden Show floor was acres of blooming flowers, vendors, and gardening ideas that I spent two full days exploring. The Steam Punk Garden and the Bee Friendly Garden were two of my favorite displays. After doing my speaking duty, I was free to explore. 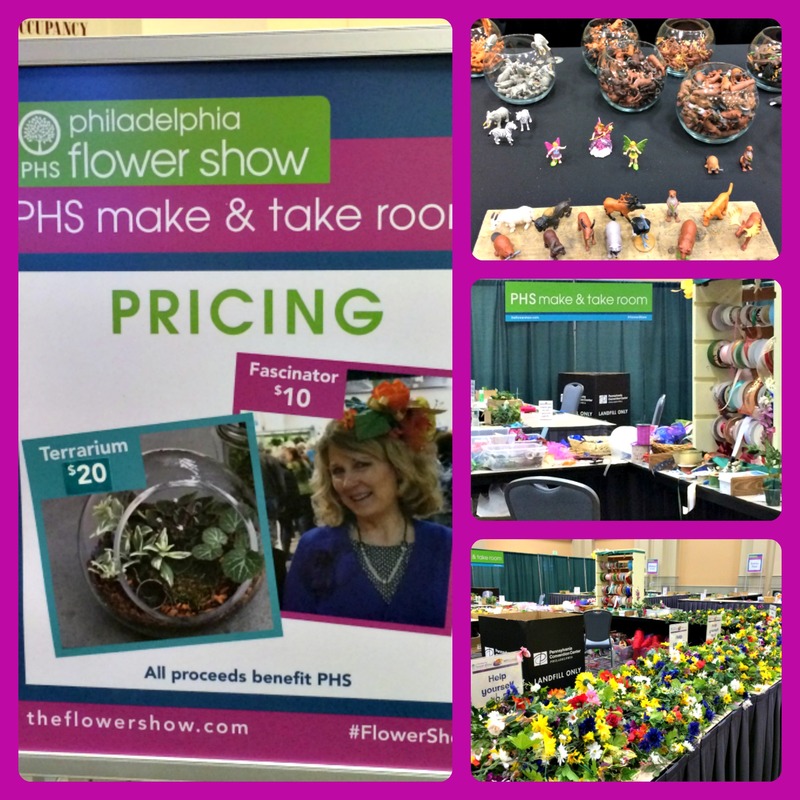 The show had lots of interesting vendors and it never got too crowded like the Philadelphia flower show where you are always bumping into people trying to get a closer look. For vendors, I was expecting the usual mix of home improvement companies and jewelry and scarf vendors. But I was proved wrong with the quality and selection of down to earth garden vendors. A gardener could get into real trouble here! I was especially interested in a Cedar Cold Frame kit to extend my growing season. See them at http://www.cedarcoldframes.com/ , but the kit was too bulky to take on a plane. I will probably order one for the spring. The cold frames were well made and they even had one that was table height so you didn’t have to bend over. Also Charley’s Greenhouses had an awesome display and I am seriously considering buying one. I need the triple wall, cedar frame “Northern Heritage” one. I will put this on my Christmas list! The vintage gardening section was incredible. I have never seen vintage vendors at a gardening show before. 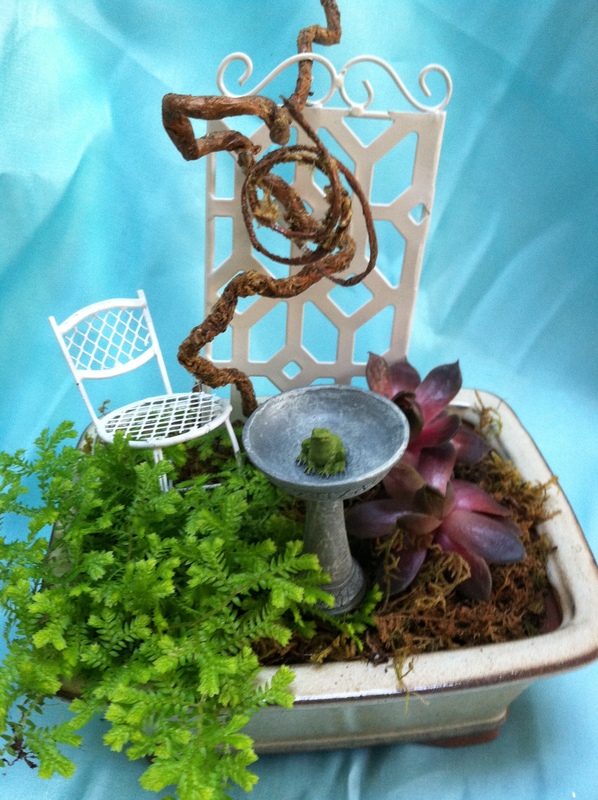 See my post at Vintage Gardening to see the different kinds of products you could buy. I went through the area three times! How about repurposing an old sink into a potting bench? Or making a hanging container out of an old funnel? Chihuly glass is everywhere in Seattle gardens because Dale Chihuly was born in Washington State. We went to the Chihuly gardens and museum in downtown Seattle and I will do a post on that garden later as it was so incredible. But you could buy your very own Chihuly knock off in the market place for quite a bit less than the real thing. The flowers of course were stunning with the orchid display especially beautiful. There was a meadow of orchids presented by the Northwest Orchid Society. Gardening in February is still going on here in the mid-Atlantic even though we have an arctic blast! For some of my winter tips on the best way to start seeds, go to Hartley Botanic’s gardening calendar. 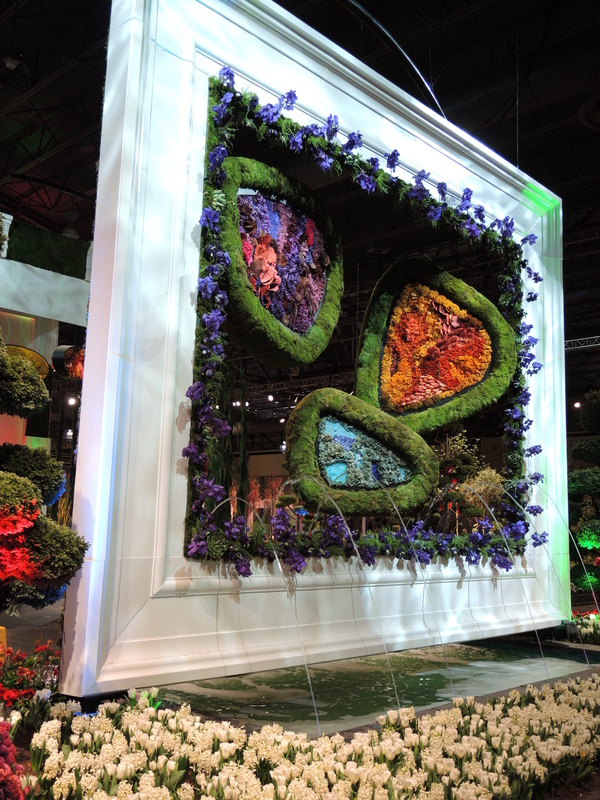 The PHS (Pennsylvania Horticultural Society)Philadelphia Flower show is the nation’s largest flower show, clocking in at 10 acres of the Philadelphia Convention Center, and features the areas premier landscape designers and florists, with cutting edge designs and horticulture. The entrance garden of “ARTiculture”, inspired by the paintings and sculptures of Alexander Calder, the artist that most of us know from his inventive mobiles, is a stunner. 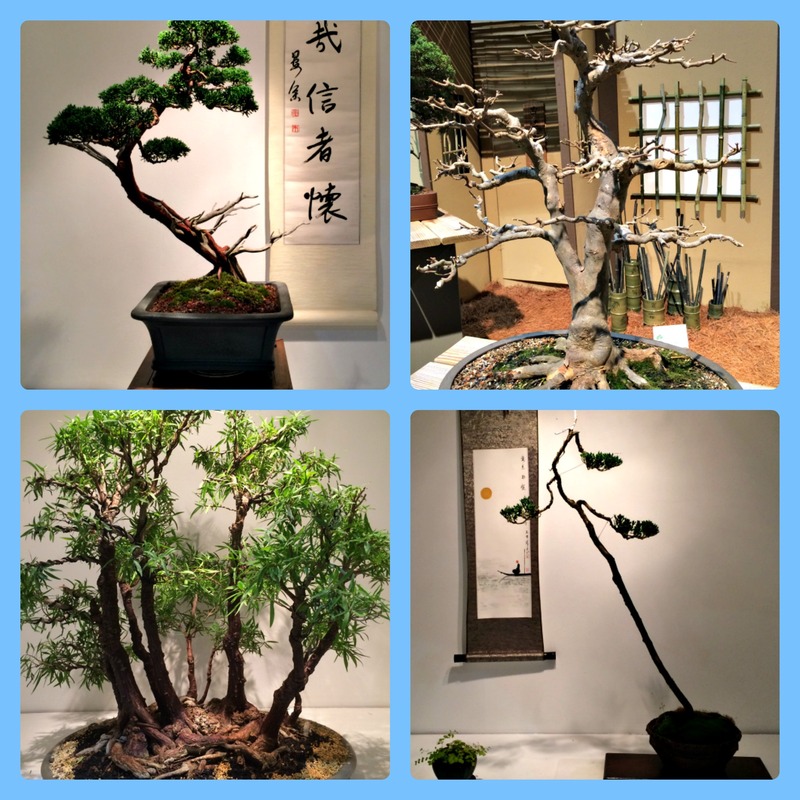 “ARTiculture”, the fusion of art and horticulture, was one of the best shows that I have experienced by the Philadelphia Horticulture Society. It seems to me that art and flowers go hand in hand, so this pairing was a natural. 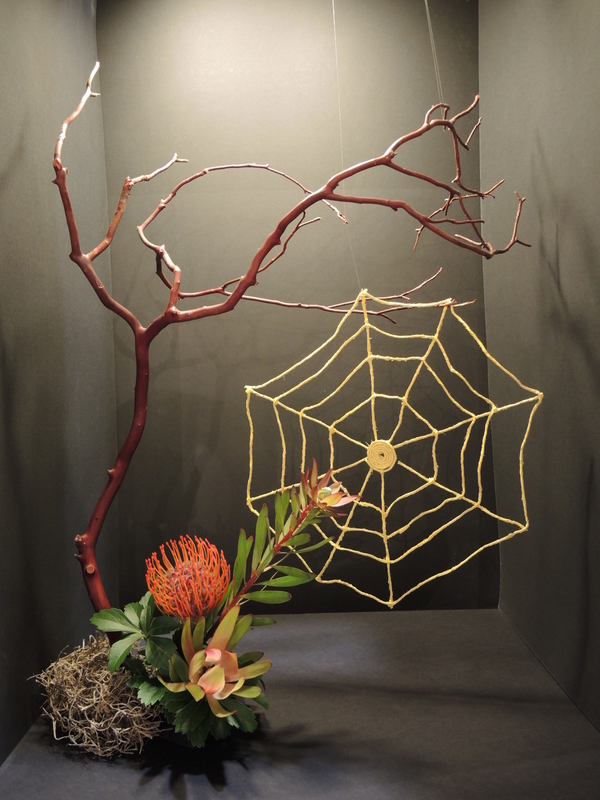 Floral design is an art form, which involves all the principles used in creating art, and a perfect theme for the show. The area’s leading art museums – the Penn Museum, Woodmere Art Museum, Grounds for Sculpture, the Brandywine River Museum, the Guggenheim Museum, the Smithsonian National Portrait Gallery, the Barnes Foundation, The Getty, and the Pennsylvania Academy of Fine Arts, all influenced and partnered with the PHS flower show in celebrating great horticultural design as an art form. The gravitas of these respected organizations that helped out with the staging of the show, brought it up a notch in my estimation. The horticulture exhibits were as usual outstanding, and I often wonder if the exhibitors have access to greenhouses as well as personal gardeners! I always appreciate it when something bizarre and odd-looking gets a blue ribbon. 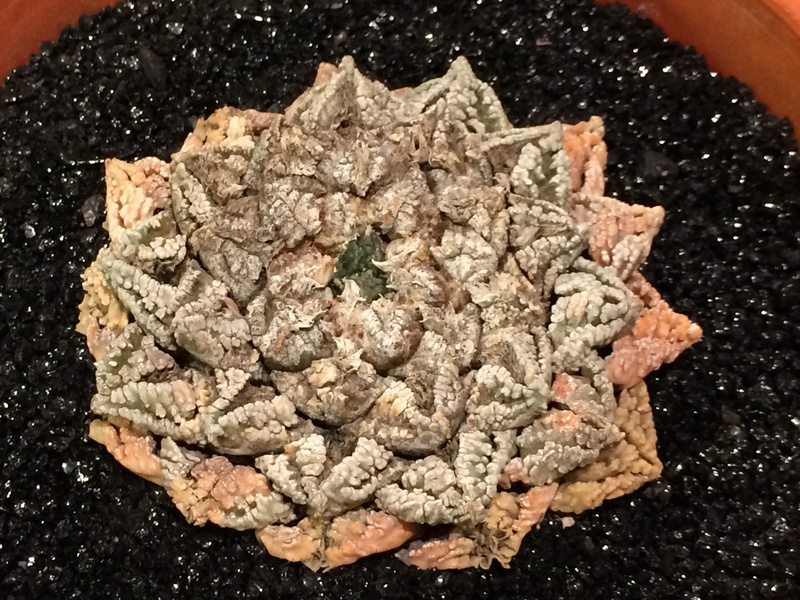 This time, it was an Ariocarpus fissuratus, a rare slow-growing cactus. Weird! 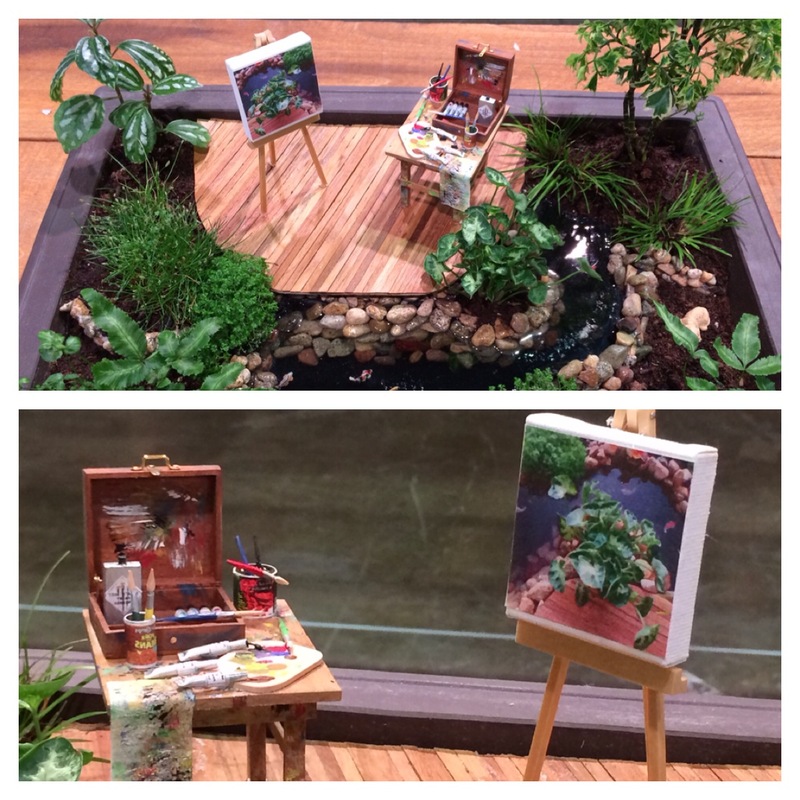 The miniature gardens were well represented and I particularly liked the one with the artist’s palette. 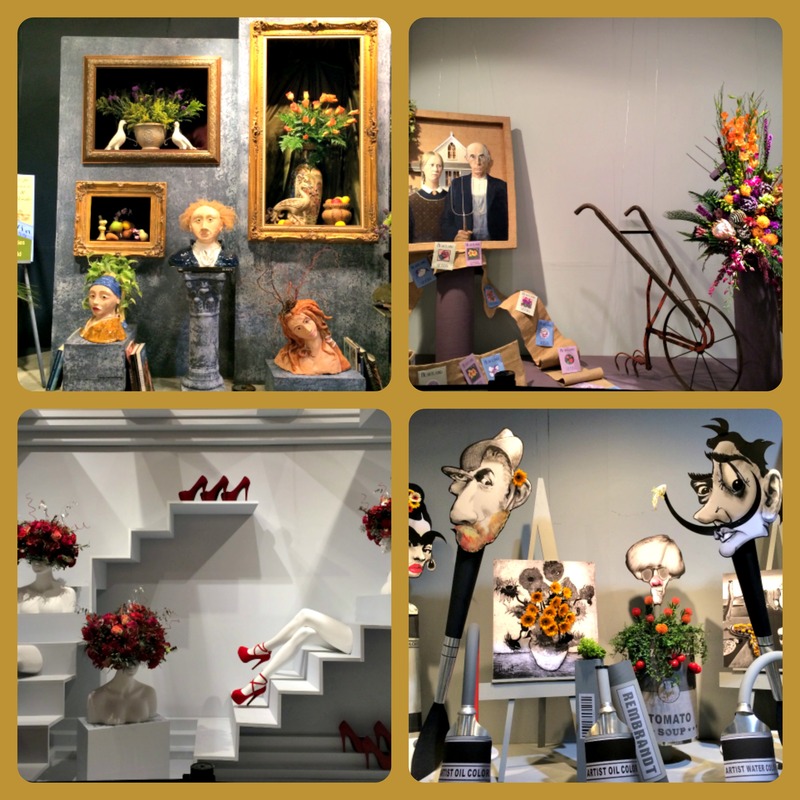 The exhibitor interpreted the show theme perfectly. I always enjoy the Bonsai displayed against a backdrop of a Japanese house, another improvement from last year. I go here to escape from the crowds and to enjoy the simple stark miniature trees. Usually the miniatures are so crowded, that you have to wait in a long line to view them. This time around, I got in early because I was judging the show and only exhibitors who were making last-minute adjustments were on the floor. The designs as usual were fabulous and I particularly liked the store windows this year which I judged. I really liked the one in the lower right hand corner that was designed as a store front of an art store. Very appropriate for the show! It did not win the blue ribbon because the flowers did not match the craziness of the cutouts. The flowers used were too small and not unusual enough to fit in with the wild cutouts. The winner for this class was the store front with the red shoes. Very cutting edge! The rumor for the 2015 theme is the movies! Here are a few from this years show that may be the precursors of next year. 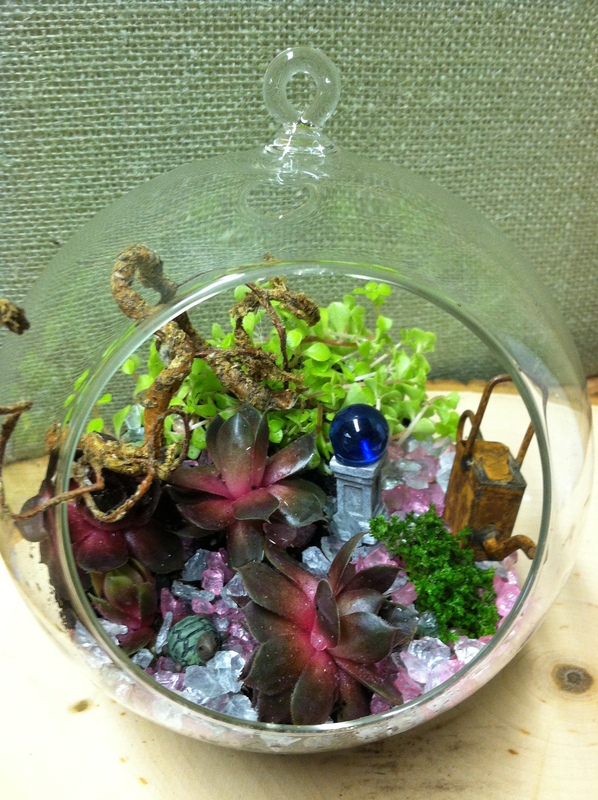 The “Make and Take” rooms as usual were a hit with lots of terrariums and “fascinator” hats being made. And talking about hats, a repeat of the hat exhibit from last year was on display and looks like it will be here to stay. I really enjoyed these. 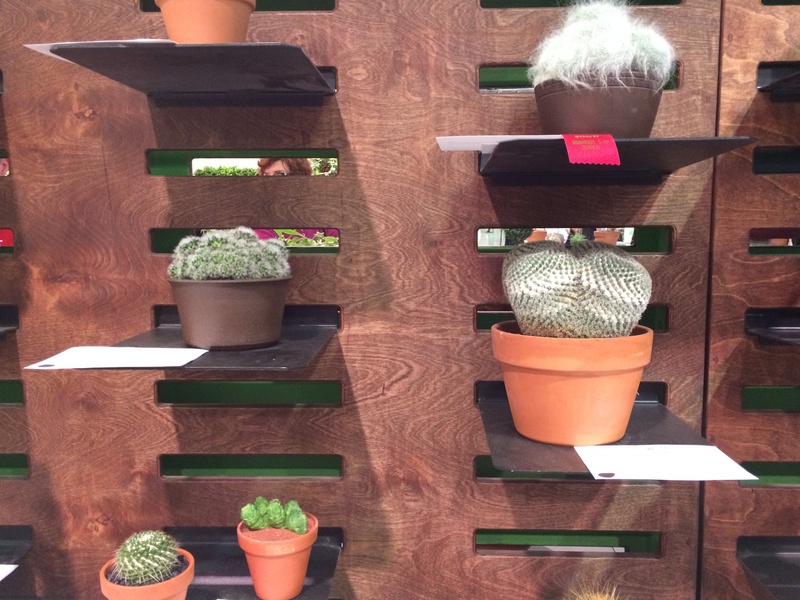 Keeping up with the popularity of vertical gardening, a new category was added to showcase new ways of gardening on a wall. 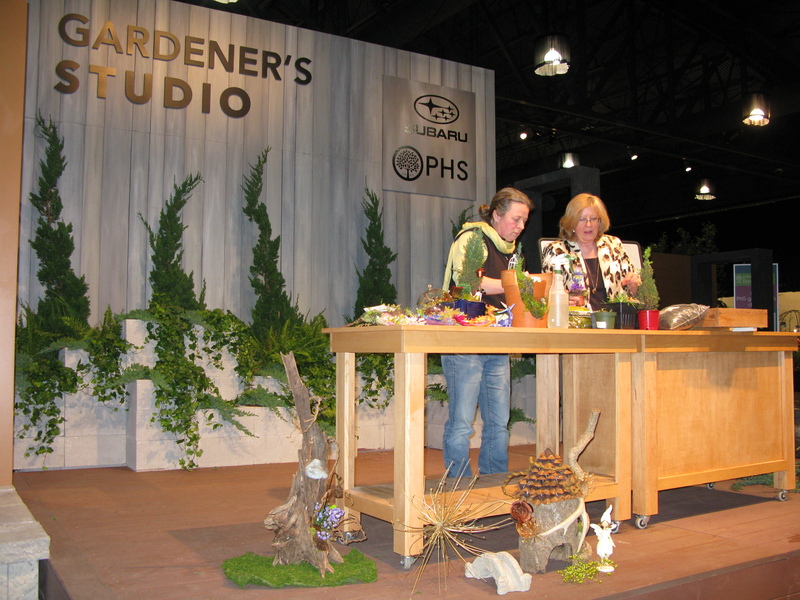 I am going to present at the Philadelphia Flower Show Gardener’s Studio on March 4th and am very excited about the topic. 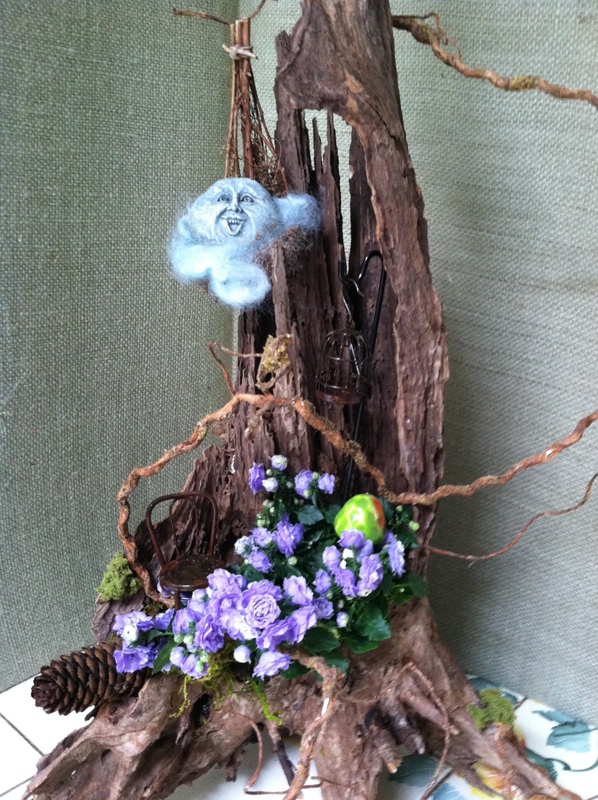 Since the theme for the flower show is Brilliant!, which is celebrating Great Britain, I thought that designing fairy gardens would fit right in, kind of like gardening with”A Mid-Summer’s Night Dream” in mind. I am frantically creating, and designing miniature gardens, houses, and fairies so that I am well supplied with examples to display. I sold most of the ones that I made in the spring, so am starting from square one in getting ready. 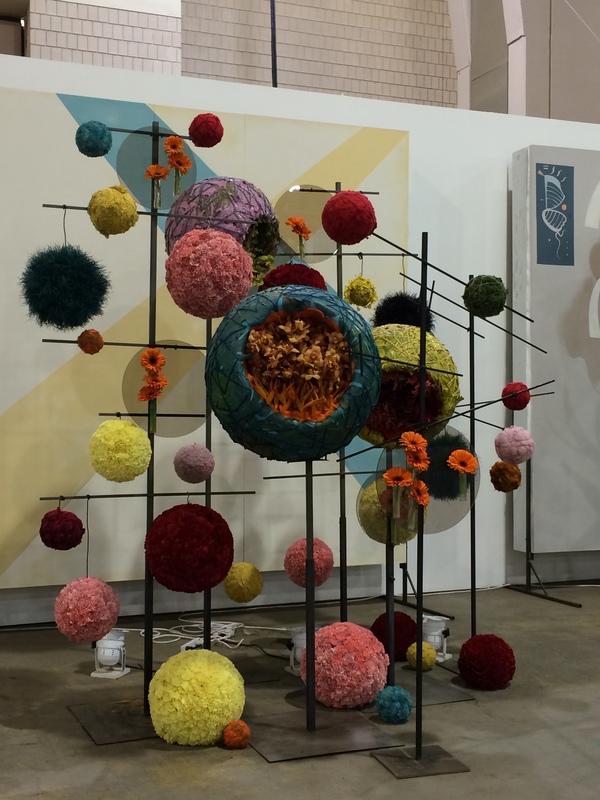 But if you can’t make it to the Flower Show, here are my guidelines and helpful hints about creating a masterpiece yourself. There are tons more that are available, but I find these work well for me. The woods and fields around your house! Fertilize sparingly – you want the plants to grow slowly! 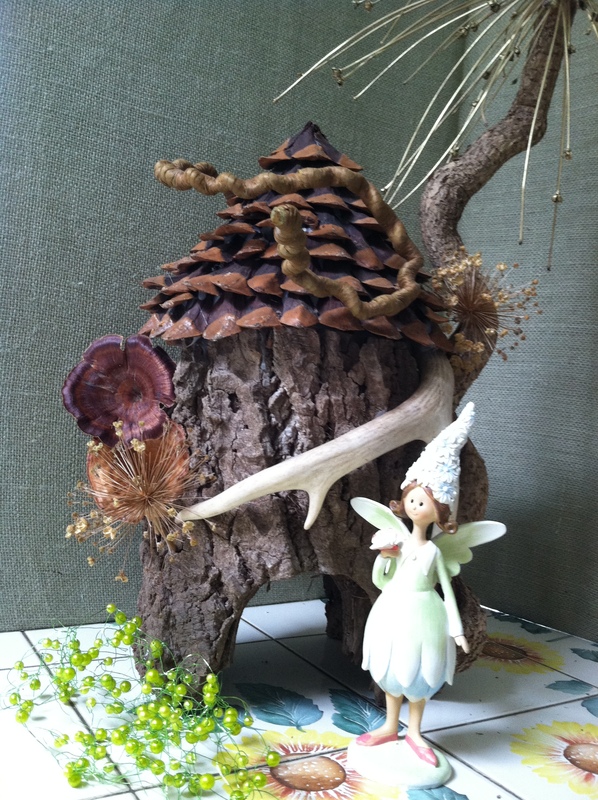 When spring comes, I like to make a fairy house to set into the garden. Each year it is different. Here is one that I made this year. To put this together, I gathered some large pieces of bark. I got mine from a tree cutter. 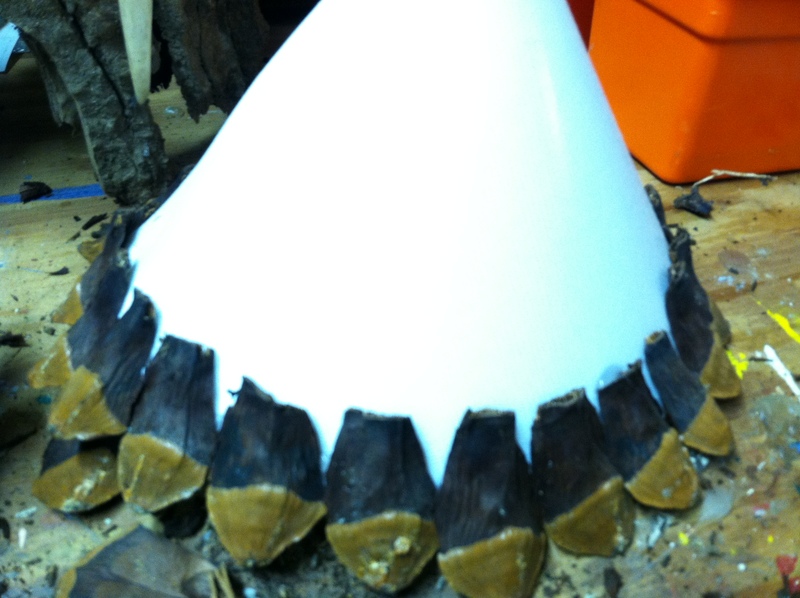 The bark was about 1 1/2 inches thick and curved so I cut pieces and glued them together to form a house about 15 inches tall and 12 inches around. Then I cut a hole through the bark for the door. 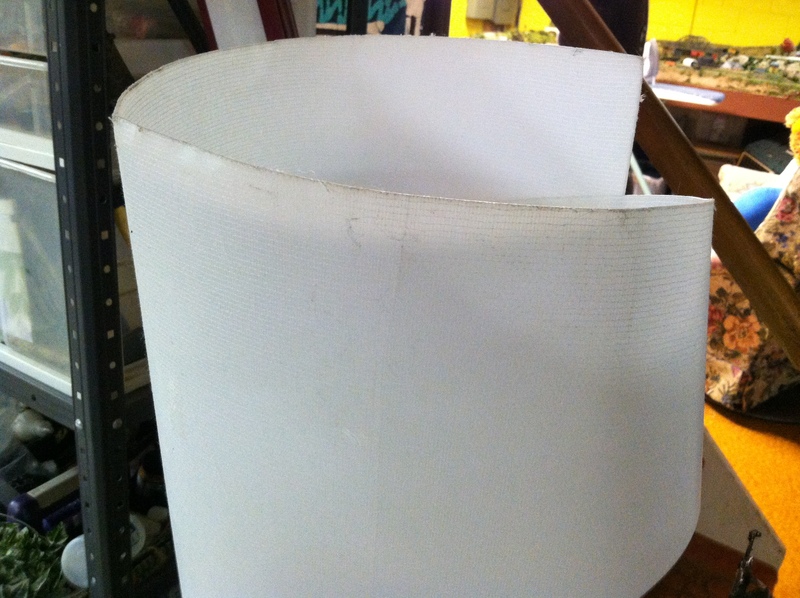 I traced and cut a circle out of wonderflex which is a composite material used for theater costumes, for the roof. It is very strong and water proof. I twisted the wonderflex into a cone shape and hot glued it together. This formed the basis for my roof. 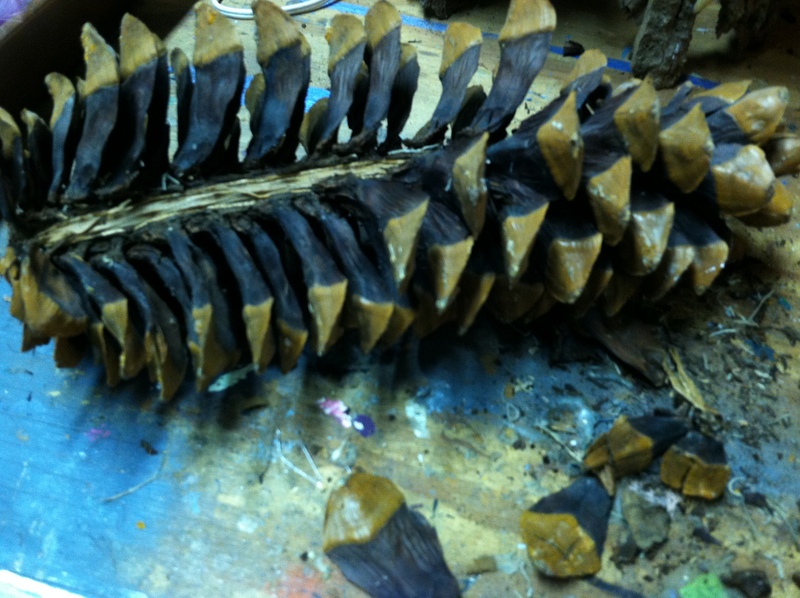 I then took a very large Sugar Pine cone that I picked up at Lake Tahoe years ago. It was about 1 foot tall! I took apart the scales which are nice and large to cover the roof. 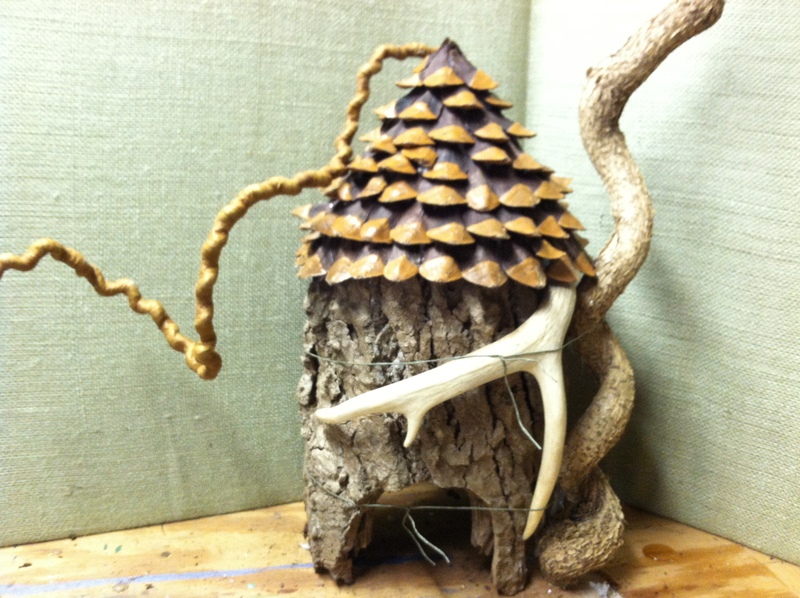 I hot glued the roof to the base and added some more natural things to make the house more interesting – antler pieces, and twisted branches. Allium seed heads are great additions. You can set this as the centerpiece of your outdoor fairy garden, and put fencing, paths, and landscape around it with moss and plants. 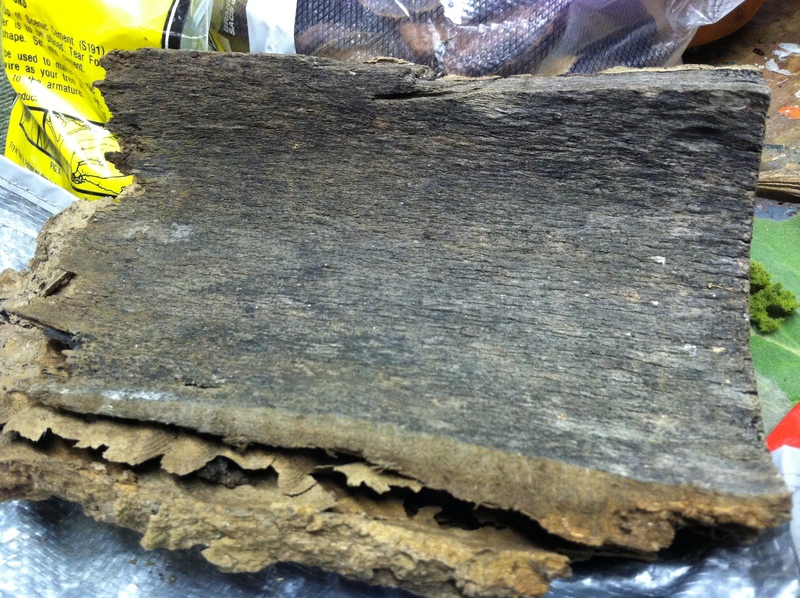 The house should last several seasons if you take it in for the winter. I hope to see you in Philadelphia!